Lemon 'biscuit' sponge: Preheat oven to 180°C. Melt the butter. In a bowl, whisk together the eggs, sugar and lemon zest until lightened in colour and creamy. Fold in the lemon juice, then flour and baking powder, mixing till even. Fold in the warm melted butter. Line the Yule log mould with parchment paper, pour mixture into log shaped cake mould. Bake for 25 to 30 minutes. Leave to cool. Assembly: Unmould the Yule log, remove the paper and slice the lemon 'biscuit' sponge in 2 layers, place on a sheet of parchment paper. Use a brush to imbibe the surface of the two pieces with lemon syrup. Spread chocolate-hazelnut spread onto the bottom lemon sponge 'biscuit' with a spatula. Cover with a layer of lemon cream. Close the log with the second lemon sponge 'biscuit' half. Imbibe the surface with lemon syrup. 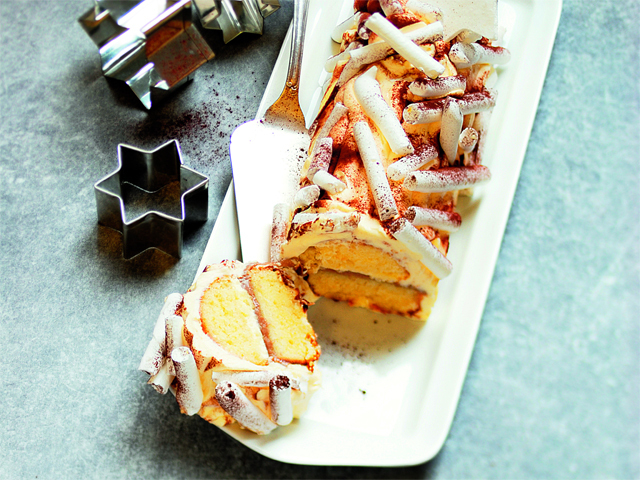 Cover the log with lemon cream by piping lines lengthways over the entire log and coat the two ends.